The alarm stirs me at 6:30 in the morning. My body says don’t move, but my mind wants coffee and brings me to my feet. I stumble downstairs, open the curtains, make a coffee, and prepare to head out. A daily walk across the road to the beach with a coffee. A pretty perfect start. But something always happens. Before I can get to that start. Before I can watch the waves roll over the sand, sip coffee as the rising sun blinds me, before I get too far. I step out the door, walk down the path, and without a warning I’m entangled in spider webs again. Now available to buy as laptop cases, mugs, tshirts, pillows and more! All available via my Society6 Art Store. Woooo nerd time! I had a call this morning from my girlfriend asking me what time I’d be home from the skatepark. She was heading out and wondered if she’d see me before I left, the reason? A parcel had arrived. I knew what the parcel was, and I was super excited to open it, but I managed to refrain until we were home together. As soon as she got back though, it was time. After a busy week of creating new designs and products for my Society6 store I had ordered a few products, keen to check the quality for customers. I opened the box with nervous excitement, but the nerves quickly disappeared. The pillows were awesome. Society6 had done a great job at printing the art, and used really nice quality materials. 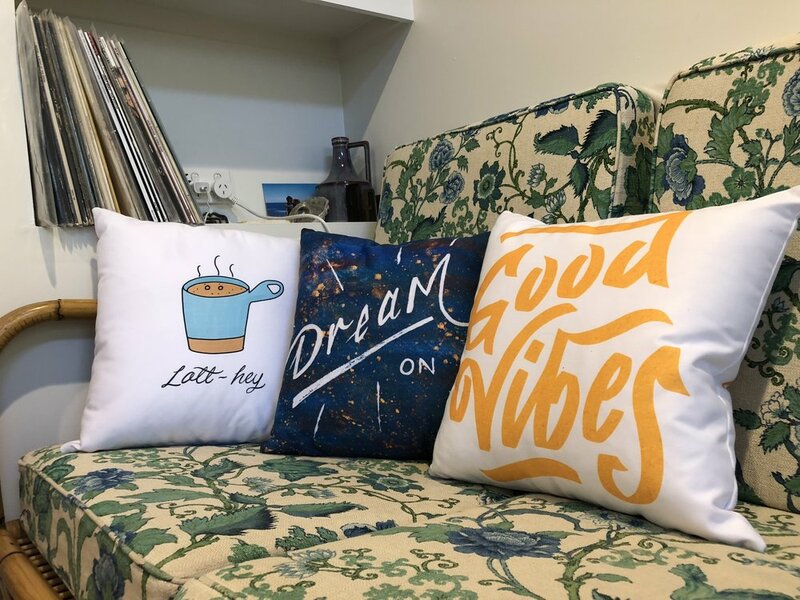 Meet the Latt-hey, Dream on and Good Vibes pillows. I opted for the 16x16” sizes, and they sit really nicely on our sofa. Maybe I’ll be napping this afternoon on that Dream On pillow! If you’re looking to brighten up and refresh your house a bit, check out my store and see if anything tickles your fancy. I’ve ordered a clock too, so as soon as that arrives, I’ll share some pictures and a review! It’s been a really nice start to the week here in Byron. The Suns back out after about 4 weeks of constant rain, the temperatures up, and daylight savings is upon us. We have long evenings and I’m loving it. We also have Halloween surrounding us. I’m not a mad fan of it all but I do love a good bit of wordplay. So I’ve created a new illustration with Halloween on the edges and writing at the centre. 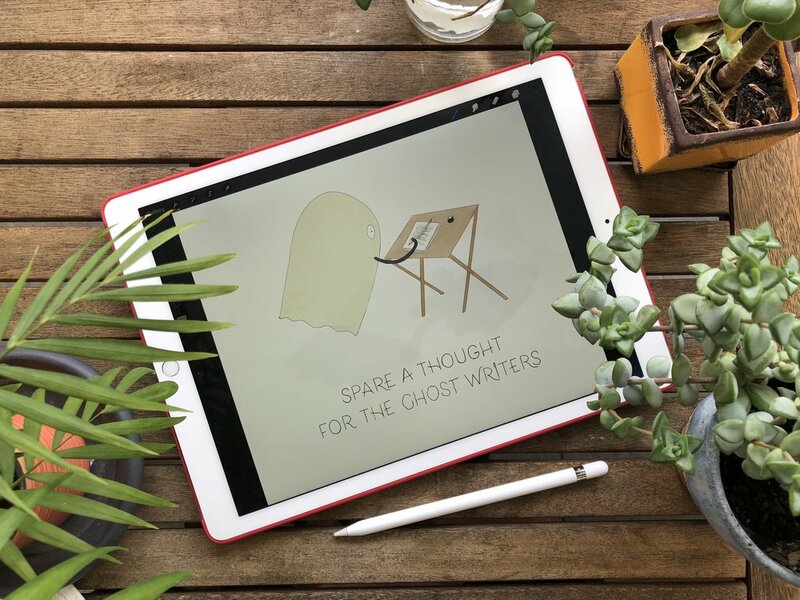 For ghost lovers and book lovers alike. Ah the ghost writers. The unsung hero’s of the New York Times Bestseller Business book world. Slaving their entire lives to pen an award winning book in someone else’s name. The piece is a watercolour style illustration which I created using the iPad Pro and ProCreate. I still can’t get over how natural the combination feels. If you do any sort of illustration or lettering work then I’d really recommend trying out this combo. I do love drawing on paper, but darn this is nice. It’s much easier to carry around with me than lettering brushes, watercolours, pencils and pens too. 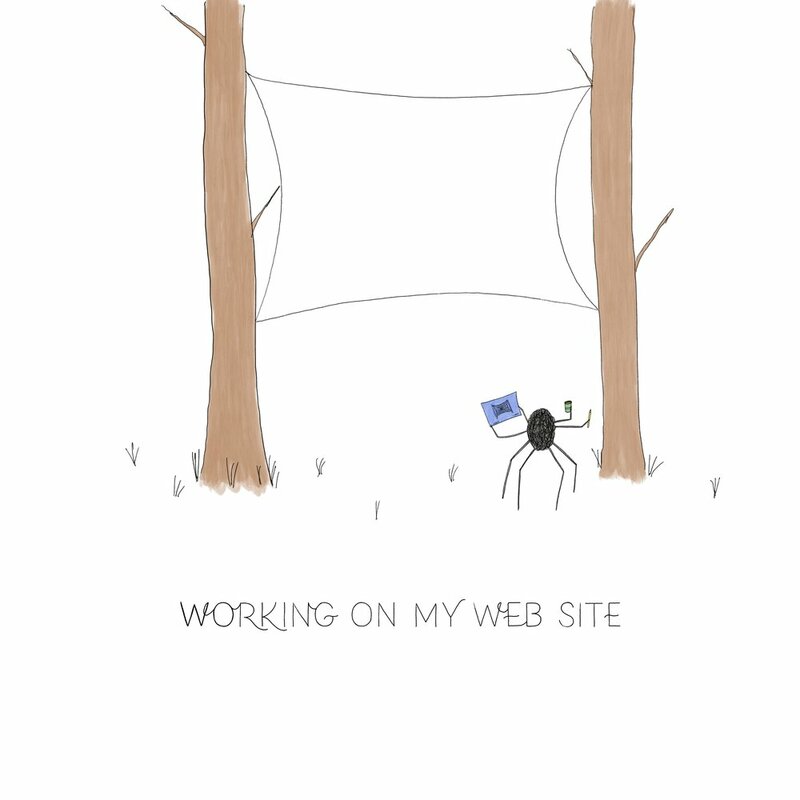 Enough about the process, if you like the illustration, then I have good news. It’s available in a ton of formats up on my Society6 Store, my favourite being the greetings card and Laptop sticker. If you like that piece. You might also like my ‘Martial Arts’ piece. Also available on my Society6 Store! Enjoy! A whole heap of updates to my Society6 shop with fun illustrations on Clocks, Pillows, Phone cases, T-shirts, Prints and more! Perfect presents and housewarming gifts. Christmas is, like it or not, coming up VERY quickly. It’s crazy how it’s already nearly November, so a Christmas present list is a must. Whilst I’ve been planning what I need to buy the family, I’ve also been creating loads of fun new illustrations. If you’re after some presents for the festive season or even just fancy treating yourself to some fresh style around the house, I’d be honoured if you took a look at my store.